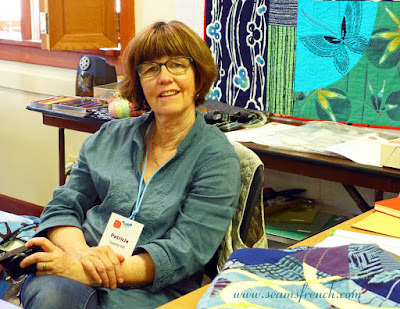 Patricia Belyea of OKAN Arts. Passionate about these textiles, Patricia has an amazing collection that she sells from her home shop in Seattle. The rich, jewel like fabrics will dazzle you with their vibrant colours and draw you in like a magnetic field. 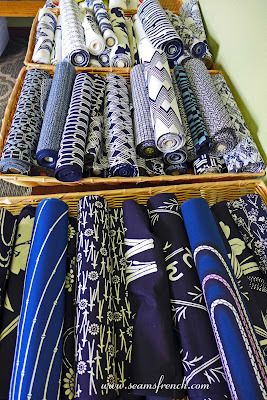 Some of these fabrics were in the pop up shop set up next to the workroom. 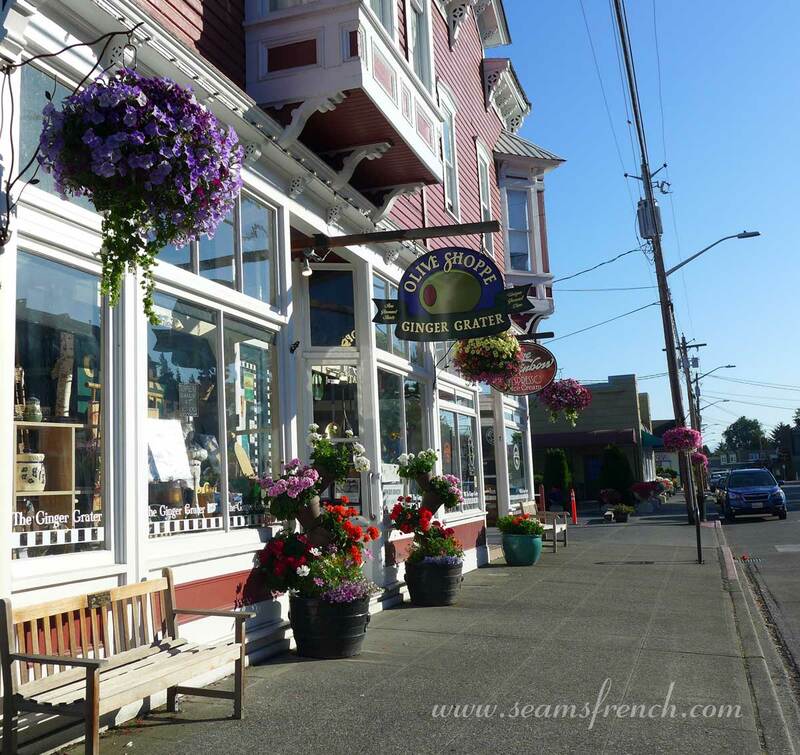 It's the best kind of candy shop, no calories! 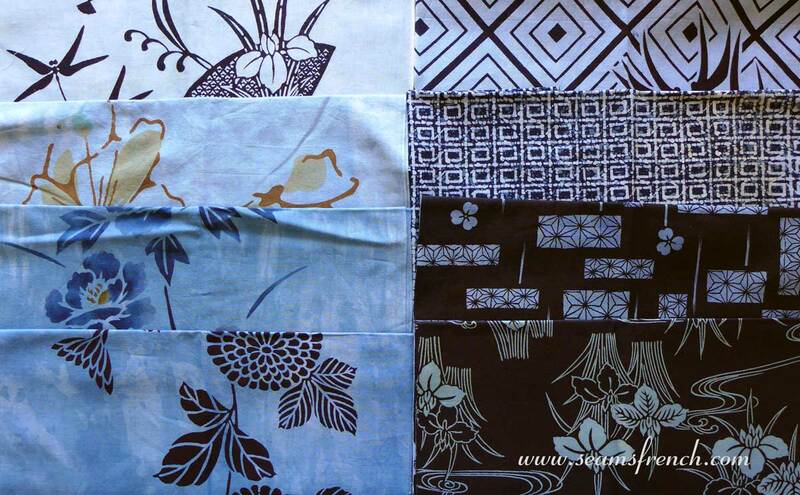 A sampling of the colourful yukatas that came home with me. ... as well as indigos that Patricia over-dyes to create more subtle tones. During the five day workshop two projects were created. 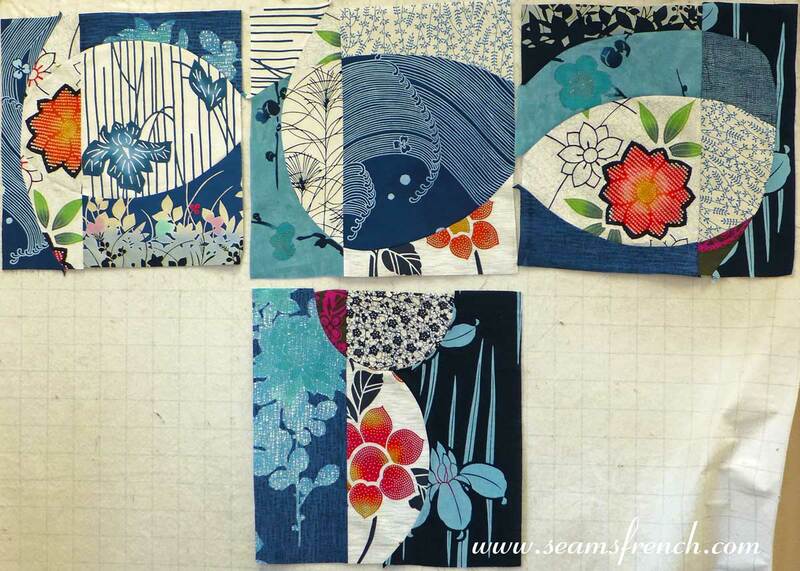 Participants were encouraged to move beyond our comfort zone and incorporate these vibrant prints into compositions of our own design using Patricia's technique for "no-fail" piecing with curves. 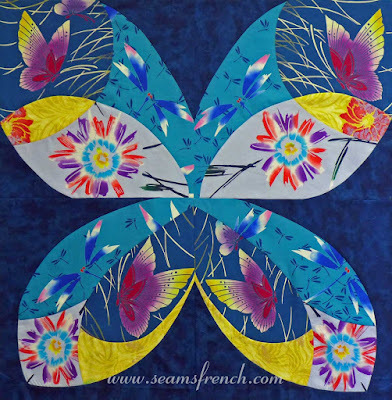 Project A focused on creating a four quadrant quilt top. 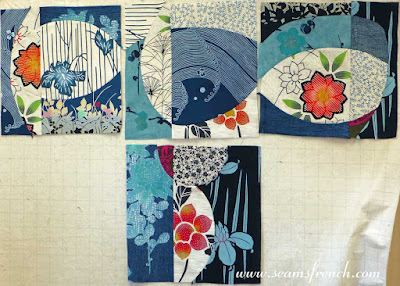 ... the layout of the blocks was up to the individual quilter. 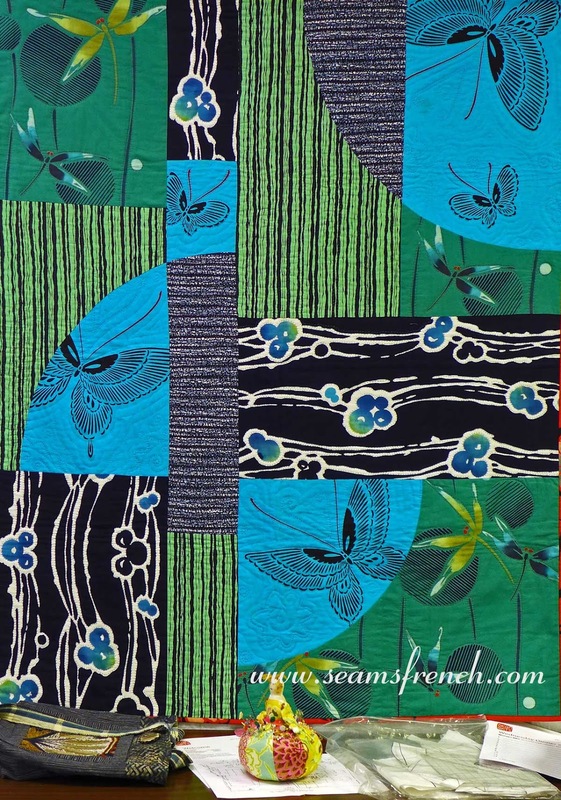 Chris composed her blocks to create a continuous design that flowed lengthwise. 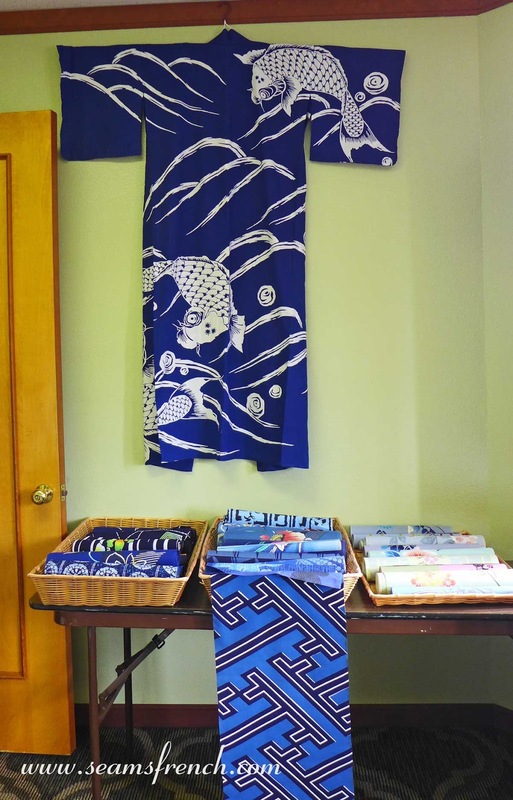 Gin's final layout is still to be determined, but I like this kimono-like shape that she had up on her design wall. 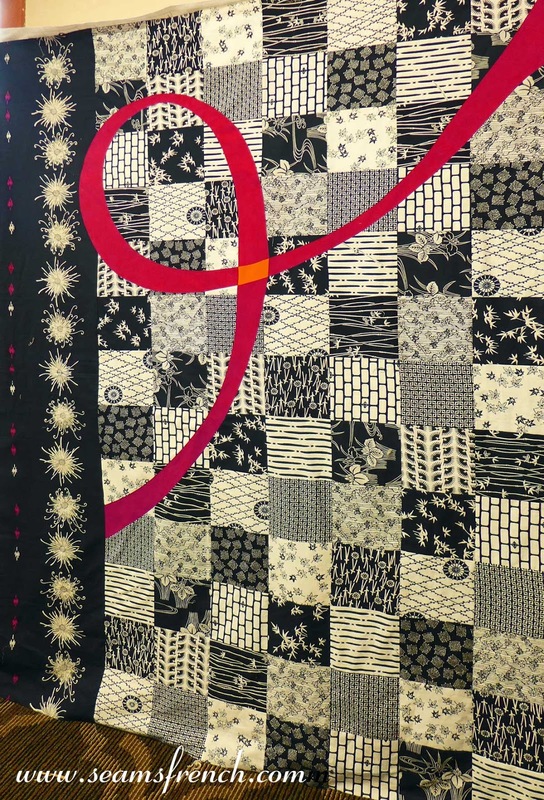 Project B (see Patricia's example quilt below) took the concept of curves into a larger composition. 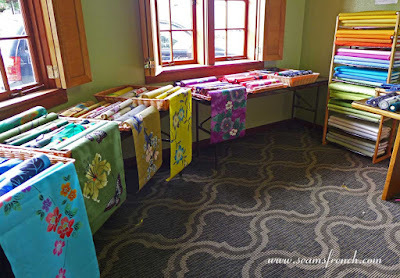 We had all brought fabrics from our home stash and were encouraged to incorporate it into the quilt top along with the yukatas. Patricia's example quilt for the second project. 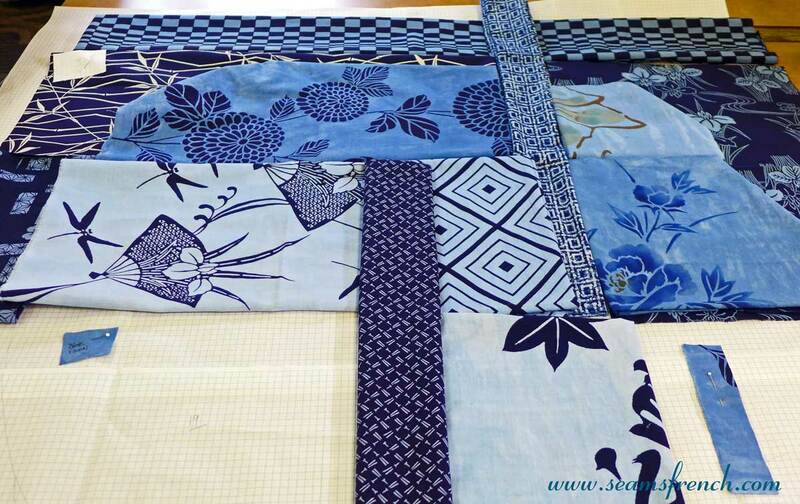 By week's end, we had designed two quilts, all in various stages of completion. 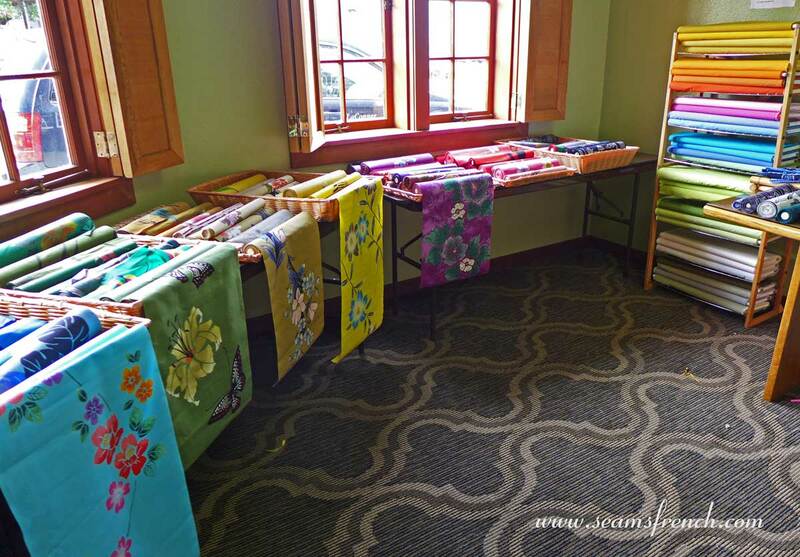 Many of the participants went home with two finished quilt tops. Sadly, not all of us were that efficient. Two of the participants, who had taken the course last year, were given further instruction on piecing tighter, more complex curves. They learned a technique for inserting a curved ribbon into the finished quilt top (below). The results were amazing; there was no puckering in the top and it lay perfectly flat. 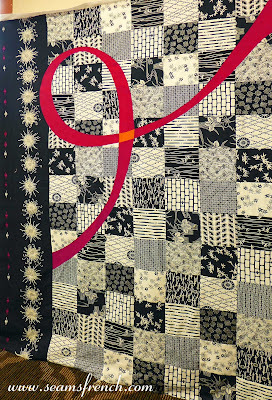 Rose completed this striking quilt during the week, using Patricia's technique to insert the tightly curved, narrow ribbon into the finished top. To see more of the quilts from the workshop, check out Patricia's blog. And while you're there, take a look at some of the other exciting things her blog has to offer. If you ever plan a trip to Japan, her website is a great resource for everything from quilting info to the practicalities of travel to Japan. 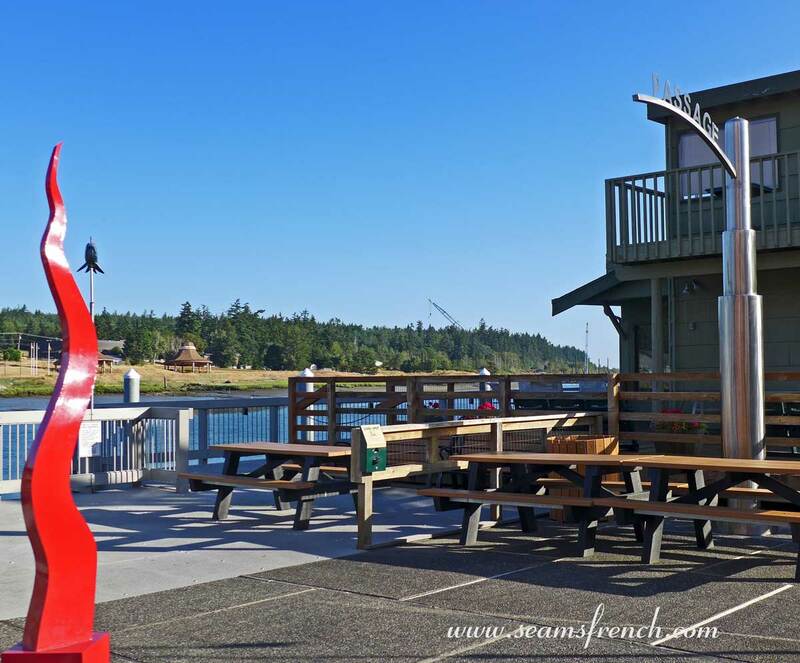 And if you're ever planning a trip to the Pacific NW, consider participating in this workshop. 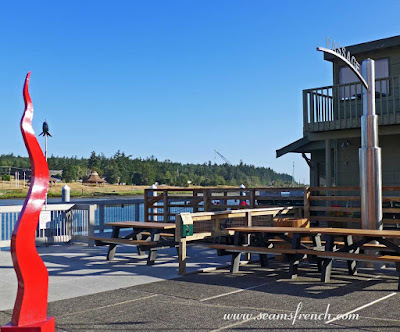 Patricia's carefully planned schedule for the week anticipated all of our needs and requirements and provided an environment conducive to productivity and fun. Everything about the week was delightful, from the energetic productivity in the classroom, to the easy going camaraderie between the quilters. Coming home with a finished quilt top is a bonus. 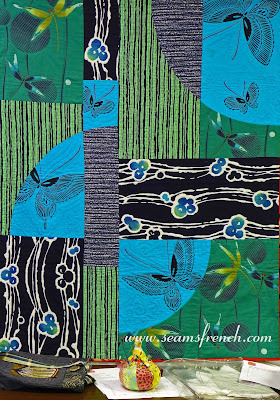 Yes, I have admired the Okan Arts fabrics from afar! It sounds like a wonderful week. Those soft curves really make the most of the elegant prints. Food for thought! 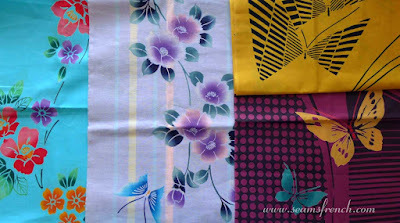 They really are fun prints to work with and you can't help yourself but become enchanted with them. It was a very enjoyable 5 day workshop. Your quilt look so smashing! What's the scale of it? I really like how you were able to get mirrored motifs. Hi Nicole. Thanks. 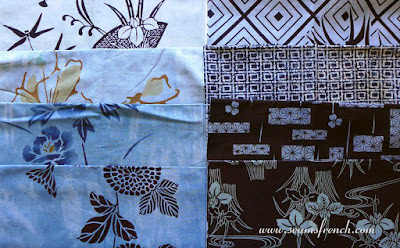 The Yukata fabrics were fun to work with. The finished quilt top, with the addition of a 3" border, measures 42.5" x 42.5".